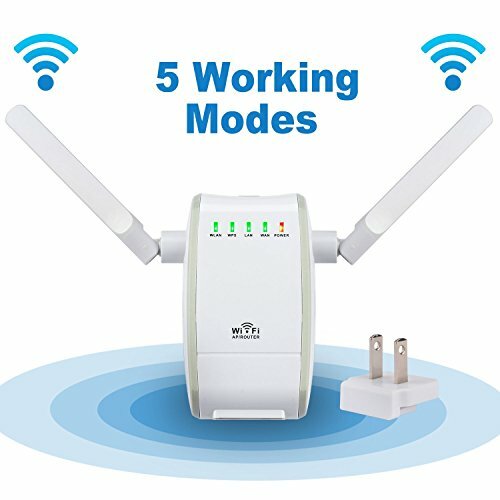 Multiple Operation Modes - Wireless Router Mode, Repeater Mode, Access Point Mode, and WISP Client Router Mode. Repeater Mode easily boosts wireless signal to previously unreachable or hard-to-wire areas. Allows wireless signal to reach through walls and windows. Easy to Install and Use - Small size and wall-mounted design make it easy to deploy and move with flexibility. Simply pressing WPS button to ensure the network is safe. Universal Compatibility - Work with any wireless device/network/router. 300Mbps Wireless Data Rates ideal for video streaming, web browsing, and Internet calling. Two Ethernet ports (WAN & LAN) allow the Extender to function as a wireless adapter to connect wired devices.